To verify that batch processing is working, send a few frames from a scene to be rendered by the Harmony Stage module. 1. Open Control Center and select the environment and job that contains the scene to render. 2. Select the scene, right-click the sample scene in the Scene panel and select Send to Rendering. The Render Network dialog box opens. 3. 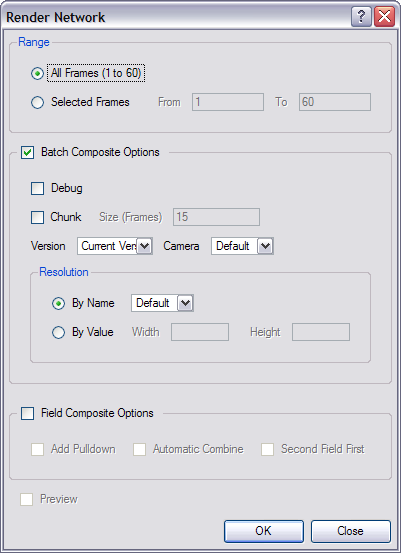 In the Range section, choose the Selected Frames option and type 1 to 5 in the From and To fields. 4. Leave the rest of the default options and click OK.
An alert should appear indicating that the scene was sent to the queue. 5. Click OK to close the alert. Now, open the Render Queue to see if your scene is being processed. 6. In the Environments section, select the environment containing the scene rendering. 7. In the top menu, select Environment > Render Queue. The Render Queue window opens. You should see the sample scene listed. Its state will change from "Pending" to "Processing" then to "Completed" after it has been rendered.